Separate gauges of truckload linehaul and intermodal rates both moved again higher in April compared to the same time a year ago, at or near their highest levels on record. 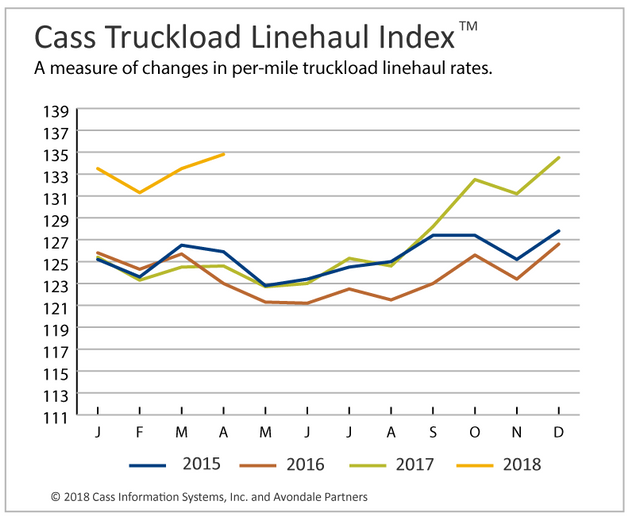 The Cass Truckload Linehaul Index continued the acceleration that began in 2017 by posting an 8.2% year-over-year increase, with the measure hitting a reading of 134.8. This is also the largest year-over-year percentage increase in this index since it began in 2005. After signaling an industrial recession in the U.S. and being negative for 13 months in a row, from March 2016 through March 2017, index has not only been positive for 13 months in a row but it is also strengthening, according to Donald Broughton, analyst and commentator for the Cass indexes. He is forecasting at least a 6% to 8% gain in truckload linehaul contracting pricing this year over 2017. "We believe that this is the strongest normalized percentage level of truckload pricing achieved since deregulation, normalized meaning except for extreme periods of recovery from recession,” he said. “The current strength being reported in spot rates is leading us to believe contract pricing rates should keep rates in positive territory well throughout 2018." The Cass Truckload Linehaul Index measures market fluctuations in per-mile truckload pricing that isolates the linehaul component of full truckload costs from others, such as fuel and accessorials, providing a reflection of trends in baseline truckload prices. 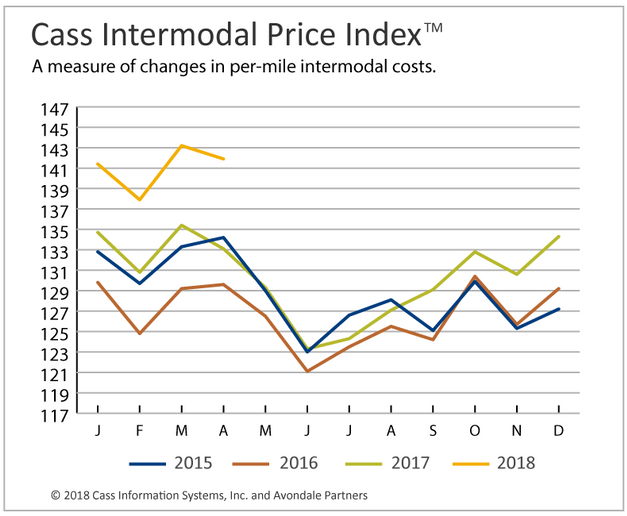 Meantime, the Cass Intermodal Price Index shows total intermodal freight cost rose 6.6% year-over-year in April. The index is now at 141.9, just shy of the all-time high of 143.2 established in March. April marked the nineteenth consecutive month of increases, and brings the three-month moving average up to 5.9%. According to Broughton, tight truckload capacity and higher diesel prices are creating incremental demand and pricing power for domestic intermodal services. The Cass Intermodal Price Index measures market fluctuations in per-mile U.S. domestic intermodal costs. It includes all costs associated with the move, such as linehaul, fuel and accessorials. Data within both measures come from actual freight invoices paid on behalf of clients of freight-payment processor Cass Information Services.